Sometimes, you have content that you feel is so important that you want to make sure everyone in your audience sees it. You can do this in Cerkl by sending that content to the top of everyone's newsletter. To do this, go to > Content Creator > Distribution Settings. Then, go to > Posting Priorities, then select "to everyone as the first story." Then, you have the option to select how many times you want this post to show up as the first story in your newsletter. 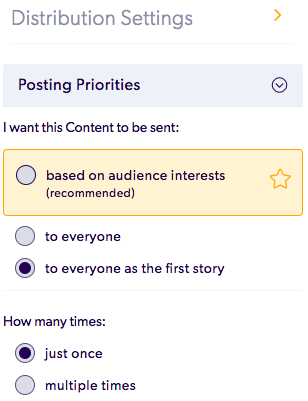 If you would like them to only see the post once, select "just once," and if you want them to see the content multiple times, select "multiple times."